Recipe Number Two Hundred & One: Page 57. To be honest the thought of a seed cake does little to excite me! I'm not the biggest fan of seeds. In my mind they are food for birds! Mary's recipe introduction did little to persuade me. She states that we will either love or loathe seed cake. This reminds me of Marmite's similar bold statement. I happen to be very fond of Marmite, so I hoped that the same would apply to this recipe! It certainly would be a shame to bake a cake only to hate it. Where's the fun in that?! Before baking could commence, we had a little drama to contend with first thing in the morning. We had a leaking pipe and there was a large wet patch on the ceiling – eeeek! Neil had been ready to leave for work but ended up having to drain all the water from the system so that a builder could fix the pipe. Isaac and I hid upstairs to avoid the chaos! Thankfully, after an hour or so, everything was sorted and Neil could go on to work, while I took Isaac to the park. It was obviously set to be one of those days. As soon as we arrived the heavens opened and we became rather damp. We had to make a speedy exit and head for home. A pregnant lady attempting to run is not a pretty sight! Back in the warm and dry we cheered ourselves up with jam and crusty bread for lunch. I was particularly excited as I'd made the large batch of strawberry jam the night before. Neither of us could get enough of the stuff; it’s addictive! After gorging myself silly on bread and jam it was time to start baking. I found it difficult to summon up much enthusiasm, which made me feel a little guilty! At least it was a simple and very straightforward recipe. I weighed equal quantities of butter and sugar into a mixing bowl. I collected the self-raising flour and baking powder from the kitchen shelves and measured them in. I now keep my flours in large plastic containers in the hope that I'll no longer find piles of flour at the bottom of the cupboard. Little fingers like to dig little holes into the bags!! Unsurprisingly I'd completely forgotten to check how many eggs I had. Thank goodness only two were required as that was all I had left – phew! After acknowledging my good fortune, I cracked the eggs into the bowl before taking a trip to the fridge. I pulled out a large bottle of milk. Just two tablespoonfuls were required. As we go through so much we buy six pints at a time. On this occasion the bottle was full and my hand trembled as the milk sloshed onto the spoon! Mary's next instruction is to beat everything together for about a minute until all is thoroughly blended. It didn't take long at all to combine and I was left with a thick smooth mixture. It looked lovely as it was, and I felt reluctant to add the chopped candied peel and caraway seeds. I've never used caraway seeds, so I turned the container in my hand to look at the description on the back of the label. It didn't sound very appealing. Apparently it has a flavor much like aniseed. My sinuses were cleared as soon as I unscrewed the lid; my goodness it had a very pungent aroma! I was to use two teaspoonfuls in total. From this I reserved a few to sprinkle over the top of the cake. Two teaspoonfuls might not sound like much but caraway seeds are teeny tiny. I carefully folded them into the cake batter along with the chopped peel, and then spooned the mixture into the lined cake tin. It would need to cook in the oven for about an hour, so I took the opportunity to get on with a few little chores. I may have sneaked in another slice of bread and jam – shhhh!! After half an hour a strong smell emanated from the oven. I had to keep peering through the door to check. Each time I felt convinced I would be greeted by a burnt cake. Thankfully it never turned black. It was, however, a deep shade of brown! I left the suspect cake to cool in the tin for ten minutes and then turned it out onto a wire rack to cool completely. Now came the taste test. Normally I dive in without a second thought, but on this occasion I was a little hesitant! Rather gingerly I cut a slice and took a small bite. At first I didn't like it. The aftertaste was quite strong. It really did taste of aniseed! I took another bite and decided it wasn't so bad. I am not normally a lover of candied peel but I was glad of it. It helped to subdue the strong flavor of the caraway seeds. As Mary describes, this cake has a lovely buttery flavor. 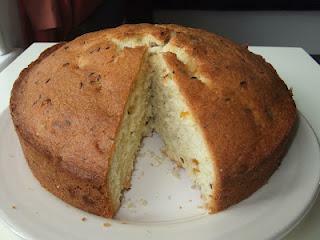 It is lighter than a Madeira cake but has similarities in both appearance and taste. Sadly I don't think I'll be in any rush to reach for another slice. I wonder if the birds will like it? I'm off for more jam and bread! !